We’re happy to welcome Adam Garnet Jones to Rich in Color today. Fire Song is out in the world now and he answered a few questions about the novel, the film, and his writing. Fire Song Synopsis: Shane is still reeling from the suicide of his kid sister, Destiny. How could he have missed the fact that she was so sad? He tries to share his grief with his girlfriend, Tara, but she’s too concerned with her own needs to offer him much comfort. What he really wants is to be able to turn to the one person on the rez whom he loves—his friend, David. How did Fire Song come into being? I started writing Fire Song as a feature film. I was looking for a story that was rooted in my own seminal experiences with isolation, suicide, and depression, but I also wanted to talk about the epidemic of suicide in Indigenous communities. I heard so many non-Indigenous people asking why, as though Indigenous youth suicide was an impossible riddle. The reasons why our young people are in so much pain could not be more clear to me. It’s difficult for me to imagine anyone who is paying the remotest attention to Indigenous people in Canada being confused by why our young people are taking their lives. I wanted to write a story that could touch on the multitude of intersecting systemic issues at play in Indigenous communities – issues that make some communities particularly vulnerable to the spiritual hopelessness that we call suicidality. Readers often wonder how much of the author’s own story is on the page. Can you share a bit about some of the similarities between you and Shane? Shane’s story isn’t my story, but he and I have some similarities. Shane grew up in a community where there is a war between Christians and traditionalists. I grew up in a lot of different places, but I’ve never had a real community except the ones that have welcomed me in; I’ve always been a guest. I’ve always been an outsider;Shane has always been home. We’re both Queer and Indigenous. Neither of us are comfortable with labels. I’m Cree/Metis and Shane is Anishinaabe. Shane found love when he was very young, but I never did. He and I are both bookworms and high-achievers – the kind of kids that teachers liked. We both stayed with people we didn’t love for too long because we were afraid of hurting them. We’re both hungry to see everything the world has to offer, but we crave community and connection most of all. We have both wanted to die over and over throughout the course of our young lives. It’s easier for us to see a path to the spirit world than it is to see our path to the future. If you could step back in time, what would you tell your younger self? So many things: Stop running and try to enjoy the climb. Go to therapy. Now. You are someone worth taking care of. No affirmation from the outside world will ever touch the sadness inside, so stop looking for others to give you permission to live. Try to love yourself. Try and fail. Never stop trying. For Tara, writing is an essential part of her life. She seems to find her voice through poetry. “But I keep thinking that a really good one–the right magic combination of words–might save your life.” Do you believe the same? Have any poems or specific pieces of writing had a big impact in your life? Reading has been incredibly important to me. Certain books have come along at different points in my life and changed me, not because they were about anything close to my own experience, but because the aching humanity, the search for connection, and the fight for survival at the core of great writing has a clearer resolution and meaning than the yearnings and tragedies of my own life. Hard things in books are always beautiful, and packed with lessons about how to live. Hard things in my own life leave me dizzy and confused. The act of reading (and writing) brings clarity to that experience. I remember once, after moving in with a boyfriend, being hit by a wave of serious depression. I wanted to die (for good reason, for no reason) as I had many times before. I went out to walk alone and I wrote down a conversation between myself and my depression in a little notebook. Through writing that conversation, I realized that the sadness would always be with me, no matter what happened in my life. It was a kind of companion that I had to learn to live with. I’ll always remember that night, because the writing allowed by to separate that sadness from my own identity. I came to a kind of peace with my depression as with a sibling that I’ve fought with my whole life. If I hadn’t been able to work through that on the page, I would have tempted that darkness by putting my body in danger. Creating a film and writing a novel are both storytelling, but what were some of the distinct challenges of each? One of the most difficult things about making a film is trying to maintain your vision for the story while under the pressure of time and budget, and while a hundred other artists are making thousands of tiny alterations to the image you have in your head. The inverse problem with writing the novel is that it is just you and the page. No other voices. No one to tell you when you’re doing well or when you’re lost. Do you see yourself writing more novels in the future or will you keep your focus on film? I would love to write more novels. I have a couple of other books in mind, but it’s difficult to know exactly how to begin. Who are the storytellers who have been inspirational in your life? Thanks for your time and for sharing so much with us! Wonderful interview! I read this book yesterday (NetGalley ARC) and was totally floored by Shane, his life, his wishes, his wants. 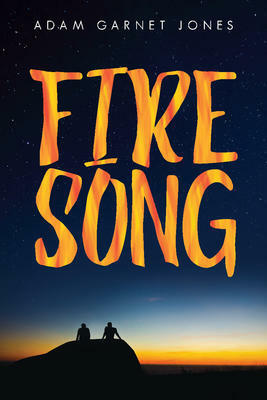 Fire Song was compelling, beautiful writing, I could not put it down; a must read for teens and adults!